The bay faces south west towards the Bristol Channel, measuring approximately 1 kilometre on a low tide, narrowing to approximately 200 metres at high tide. The beach is sandy, with a shingle bank at the high tide mark, backed by steep sandstone cliffs. The village of Southerndown is located north of the bay. The coast waters and coastal belt is listed as a Site of Special Scientific Interest, confirming the high conservation status of the Area. The water quality sample point is located south of the car park. Natural Resources Wales continues to work to establish sources of pollution around Southerndown. Some of this work is carried out in partnership with the Vale of Glamorgan Council and Dŵr Cymru Welsh Water. Inspections are carried out by Natural Resources Wales in partnership with the local authority and the water company. These are carried out pre-season (before the 15th of May) and mid season if required (during the bathing water season). There are no outfalls in the Bay’s catchment, however Southerndown could potentially be impacted by numerous storm, emergency and surface water outfalls which discharge into the river Ogmore, 3.5 kilometres north of the Southerdown, particularly during heavy rainfall. These protect domestic properties in Southerndown from being flooded by sewage during heavy rainfall. Natural Resources Wales has developed a good working relationship with Dŵr Cymru Welsh Water and liaises regularly to identify problems that could affect bathing water quality. Natural Resources Wales and the Vale of Glamorgan Council have been working together to improve the bathing water quality at Southerndown for a number of years. As a result of this work, significant improvements were made to the sewage infrastructure in 2009. This work was carried out jointly, between the Vale of Glamorgan Council and the landowners Dunraven Estates. Wrongly connected waste water pipes can affect the water quality of rivers and the sea. Natural Resources Wales is working with Dŵr Cymru Welsh Water to trace waste water misconnections from household toilet and utility facilities, to the private and public surface water systems, discharging to the River Ogmore. Modern sewerage systems have two separate systems, one takes foul sewage to sewage treatment, the other takes rainwater runoff through surface water drains to rivers, lakes and the sea. Misconnections occur when waste water pipes are plumbed into surface water drains instead of the foul water sewerage system. This can give rise to pollution when the waste water is discharged directly to the environment through the surface water drain. For example, a washing machine or toilet may be incorrectly plumbed so that it discharges to the surface drain rather than the foul sewage drain. Phytoplankton (microscopic algae) naturally increase in number at certain times of the year. This process is known as a phytoplankton bloom. This bathing water does not have a history of phytoplankton blooms. Streams are typically affected by sewage or industrial run off from further up the catchment. During and after periods of heavy rainfall, run off from agricultural and urban areas will be greatly increased. Southerndown is influenced by two main fresh water inputs, the Nant y Durfol and an un-named watercourse running from the Pant-y-Slade area. The streams meet in a culvert at the bottom of the car park and flow onto the beach through the shingle bank by the slipway. Both of these streams are seasonal and can dry out during the bathing water season. This bathing water is also located close to the estuary of the River Ogmore. This has a large and varied catchment, which can be influenced by agricultural, urban and industrial areas. This may impact bathing water quality at Southerndown following periods of heavy rainfall. There are no sewage treatment discharges in the catchment of the Southerndown Bay. Pen-y -Bont Sewage Treatment Works discharges into the estuary of the River Ogmore, approximately 3 kilometres to the North. Disinfection through ultra violet treatment of the effluent protects bathing water quality. Natural Resources Wales samplers make visual observations of the beach at every visit. This includes assessments of sewage debris, animal faeces, litter and oil or tar. At Southerndown, data are available for the four year assessment period from 2014-2017. Sewage debris was observed in trace amounts on less than ten per cent of occasions and in greater amounts on one occasion in August 2014. Animal faeces was not noted at this site. Trace amounts of litter were observed at the bathing water between twenty per cent and one third of the time and in greater amounts on less than ten per cent of additional occasions. Oil and tarry residues were not noted at this site. 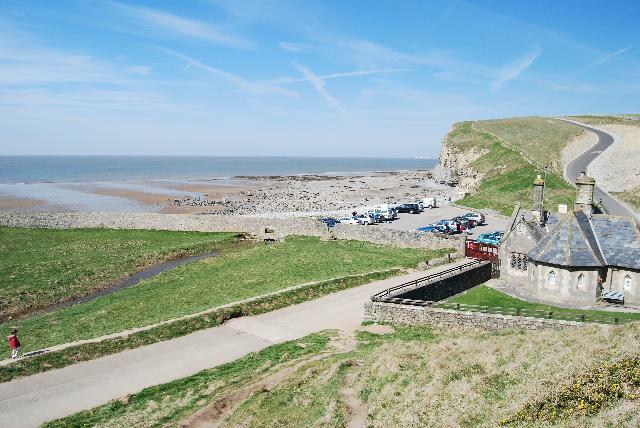 Natural Resources Wales and the landowners of Dunraven Estates have been working together to improve the bathing water quality at Southerndown for a number of years. As a result of this work, significant improvements were made to the sewage infrastructure in 2009. This work was carried out jointly between the Council and the landowners, Dunraven Estates. The natural drainage (hydrological) catchment surrounding the bathing water is agricultural with a few residential properties and the beach car park, Heritage Coast Centre and public toilet block, immediately behind the beach. There are several small freshwater streams that flow directly onto beach. The River Ogmore meets the sea 3.5 kilometres North West of the Southerndown Beach, which may also influence bathing water quality, depending on tidal currents and weather conditions.